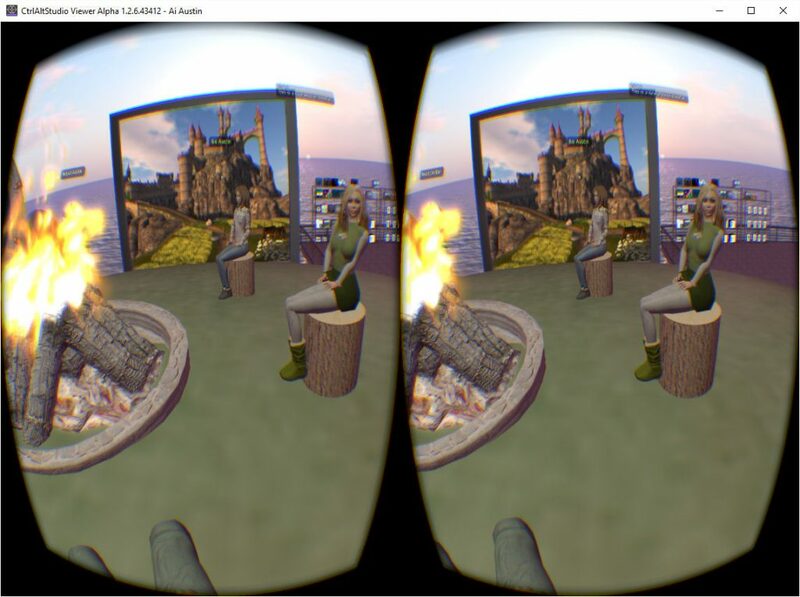 A number of “Social VR” applications like vTime are now appearing for the Oculus Rift and HTC Vive which provide a meeting space in which a small number (4 to 8 typically) people can meet via avatars in a scene which often can be selected or tailored from amongst a library of interesting areas. Some have projection screen to share media or show 360 degree surround images. 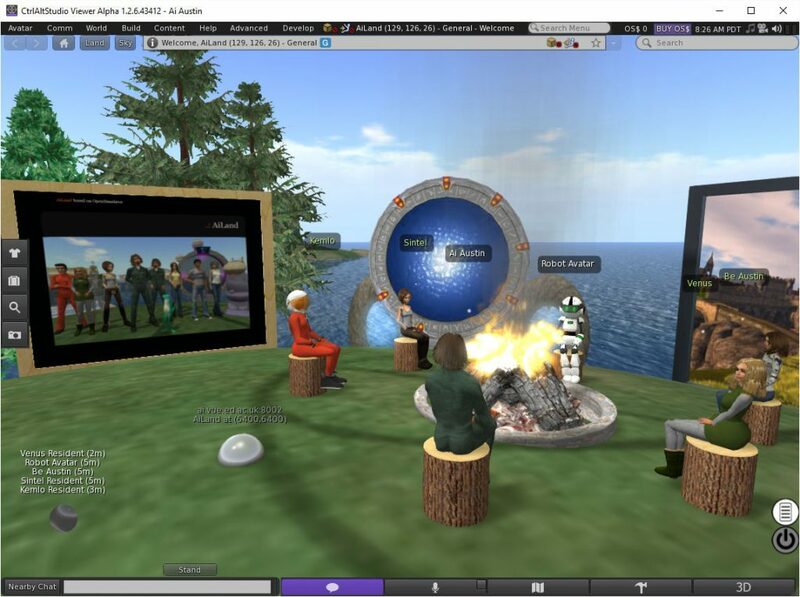 As a test, I met other avatars on an existing “welcome” region on an OpenSim grid… one where there is a simple campfire meeting place surrounded by shared media and presentation screens, and a number of items that allow users to obtain avatars and clothing to tailor their appearance. The region also includes teleports to a number of other regions on the same grid and “hypergrid” portals to grids run by others, including OSGrid with over 8,000 other regions on it. Excellent quality voice communication is directional and in 3D (via Vivox). Text chat and sharing of information such as web links or other details are accessible via a txt chat window or via bubbles over the avatar’s heads. Avatar animations allow heads to rotate to face where the user directs their gaze, e.g. towards a speaker, and to animate their hands in a suitable manner for their mode of communication and its volume. The region performs very well in VR via the CtrlAltStudio viewer in both 1st person perspective (left hand image) and 3rd person perspective (right hand image). Even set for “ultra” graphics, shadows and 256m view distance (all of which could be significantly reduced for such a simple usage), the performance is good with a solid 45FPS on an Oculus CV1 (which can achieve 90FPS) indicated via the Oculus Debug Tool. 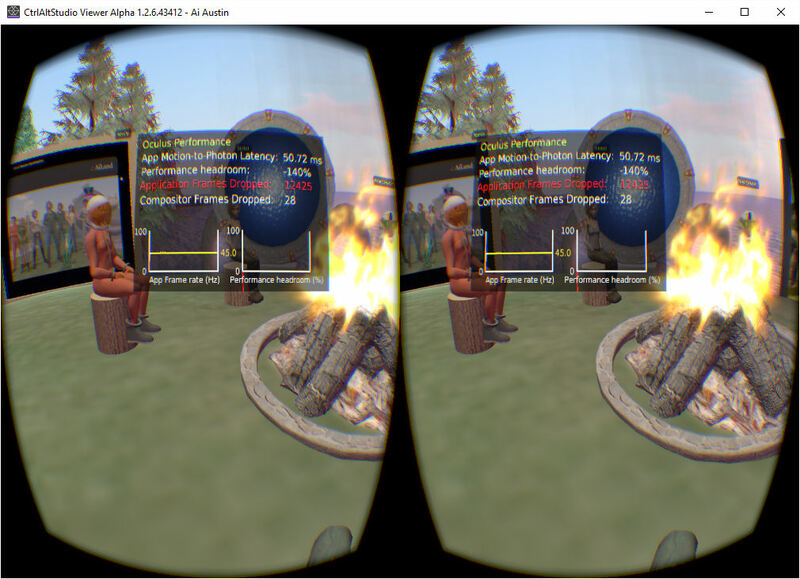 Most of the “Application Frames Dropped” as shown by the Oculus debug Tool are when the viewer is in 2D mode or when the viewer application does not have mouse focus. 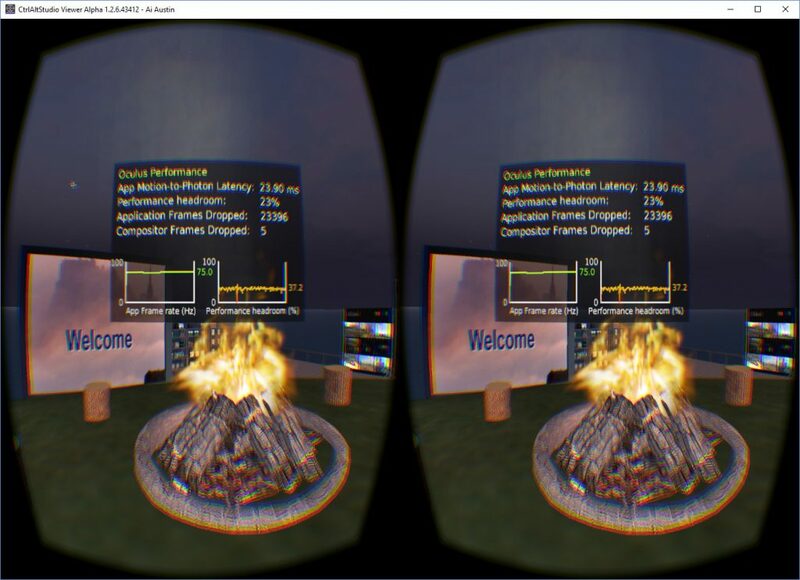 When in regular Riftlook and the viewer has mouse focus, in the campfire test above achieving a stady 75FPS and an “App Motion-to-Photon latency” of about 24ms, only 1 frame was dropped each few seconds when there was a little blip on a regular basis. But if the viewer did not have mouse focus (e.g. if you selected another app in the foreground). the “Performance Headroom” dropped instantly to around -270% and the “App Motion-to-Photon Latency” to around 55ms. 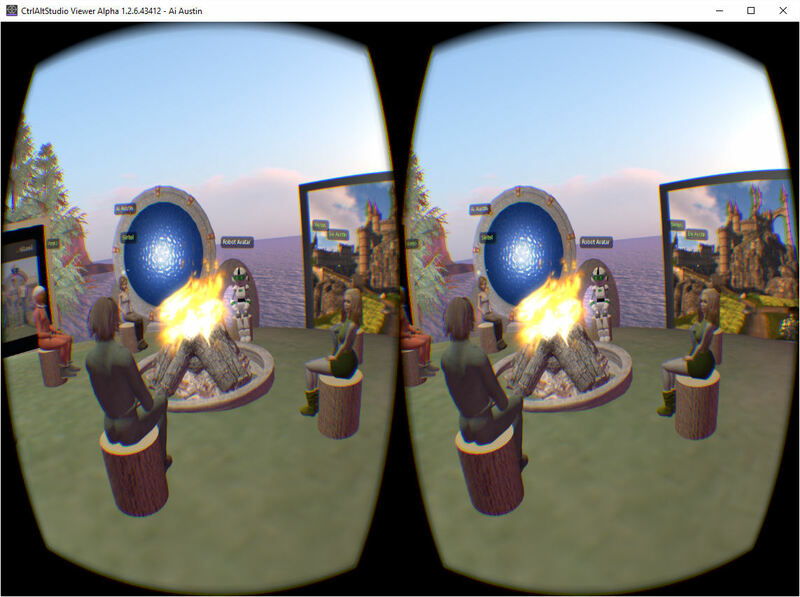 This entry was posted in Oculus, OpenSim, Virtual World, VR and tagged Campfire, CtrlAltStudio, Oculus, OpenSim, VR. Bookmark the permalink.